Let’s Golf, a $6 3-D iPhone game from Gameloft, mixes rich graphics with solid controls and a nice set of options. The result is a very fun, surprisingly deep mobile golf simulator. When you first launch Let’s Golf—and every time thereafter—you’re greeted with a 30-second intro video. That’s a bit much; even though it’s skippable by tapping the Done button, you’d think developers building a mobile game would know better than to put up barriers to getting into the game quickly. But as fun as Let’s Golf’s good parts are, you’ll learn soon enough that there’s a disappointing amount of waiting while you play. Swing Time: Let’s Golf gives you two ways to control your swing—in this method, you tap once for strength and tap a second time for accuracy. The game’s sole “loading” screen—with the Let’s Golf logo and a small animation—appears constantly, in between each hole. I assume there are memory issues at play here that make this necessary, but it’s one of the only real notable downsides in an otherwise entertaining game. The imagery in the game is superb. The trees, grass, and blue sky aren’t photorealistic, but they come impressively close. Attention to detail is excellent: You’ll spot airplanes, hang-gliders, and parachutes soaring in the sky, and you’ll see leaves drifting down from the trees. Let’s Golf offers two separate control mechanisms. 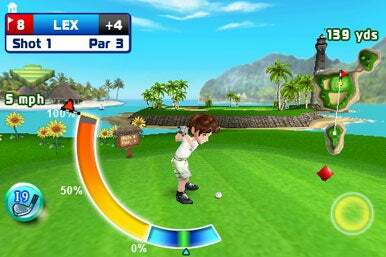 The first is the familiar golfing video game interface you may have seen before, where you tap once for strength, and a second time for accuracy, aiming to time your taps with an animated gauge. The second mechanism embraces the iPhone’s multitouch screen a bit more, and it’s awfully tricky to describe in words. Basically, you slide your finger in a golf swing-like circle, and how far back you slide your finger determines the strength of your swing. Although the latter mode is called “advanced,” I find that it’s actually easier than the traditional controls, because it’s possible to abandon your shot halfway through if you mess up when setting your power level. Either way, each control scheme is fun, and I switch between the two methods at whim. The game features a variety of play modes and difficulty levels. You can play a quick round of three random holes (from random courses), compete in a tournament against computer-controlled opponents on 9 or 18 holes from one course, or just “free play” on the course of your choosing. Winning tournaments unlocks additional courses, outfits, and gear for the golfing characters. Those characters, by the way, are pretty funny. They each have unique traits—some are more accurate, some can swing more powerfully. And when they bogey, or heaven-forbid, double-bogey, their emotional disgust-laden body language is a hoot. Multiplayer options in Let’s Golf are strong: You can take turns by passing your iPhone or iPod touch to a friend, or you can connect via Wi-Fi. Each of Let’s Golf’s four courses is beautifully rendered in 3-D, and the graphics never seem to stutter or slow down. The in-game (virtual) camera work is excellent; whether following the ball into the sky as your shot arcs, or zooming in and out appropriately as you putt, it’s implemented as well as the best golfing sims. I’m impressed by Let’s Golf. The game sports everything I look for in a golfing game, looks great, and plays well—it’s a winner. Let’s Golf is compatible with any iPhone or iPod touch running the iPhone 2.2.1 software update.